Both heat and cold therapy are beneficial and can provide effective relief from lower back pain. If you are like many people, though, you might not know when to use heat vs. when to use ice for lower back pain to achieve the maximum benefit. If you are suffering from lower back pain, read on to discover whether you should be using heat or ice. In most instances, you should use ice on your back for the first 24 to 72 hours following an injury. Cold therapy helps minimize swelling and inflammation. This, in turn, eases your pain. Cold therapy may also decrease tissue damage. Whether you use an ice pack, a frozen towel or even a bag of frozen vegetables, place a cloth between your skin and the source of cold to prevent ice burn. Cold therapy should be applied for no more than 20 minutes at a time, but it can safely be applied up to 10 times in a 24-hour period. Once the initial inflammation and swelling have subsided, switch to heat. Heat stimulates blood flow to the affected area and helps facilitate healing. It may also decrease stiffness and prevent pain signals from traveling to your brain. When using heat, you can choose between dry heat or moist heat. Dry heat is generally easier to apply, but it may make your skin feel dehydrated. Moist heat penetrates your muscles better and may work better for easing your pain. If you have open wounds, dermatitis or diabetes, avoid heat therapy altogether. If you suffer from chronic lower back pain, the decision between when you use heat vs. when to use cold isn’t quite as clear cut. For most people, obtaining effective relief requires finding a balance between using both heat and cold. If you do exercises to strengthen your back, you may find that applying heat first helps warm up your muscles and get through your workout with ease. Cold works to ease inflammation and pain following a workout. 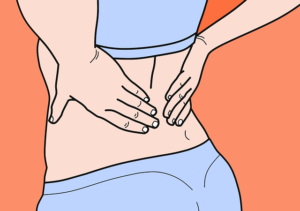 Chronic lower back pain should be assessed by a medical professional. If you suffer from lower back pain, your Denver physical therapist can help you determine the best course of treatment. To learn more, contact Denver Physical Medicine today.